Robots have the potential to display a higher degree of lifetime morphological adaptation than natural organisms. Not if we don’t let them! But I digress. The researchers, a multinational team from Lausanne, Lisbon and Brussels (led by Marco Dorigo of the latter), point out that this amazing potential is, at present, unattained. Why? Because the swarmbots we’ve seen tend to outsource their intelligence to a higher power like a computer watching them from above. They’re more like remote limbs than independent bots. To fix that, to me reassuring, weakness, the team decided to imbue each robot with the ability to control both itself and its brethren. These MNS robots all have their own CPUs, sensors, wheels and so on, and can operate independently. But when one connects to another, it subjects its will to the “brain” robot and becomes as a mere appendage to it. 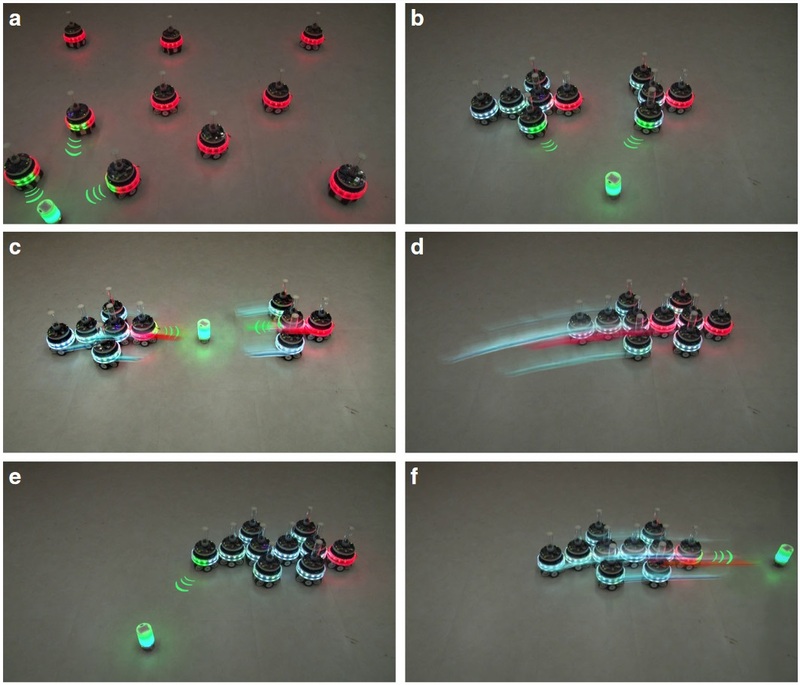 Bots operating independently avoid a green stimulus, then operate as single units once connected to do the same thing. Instructions always originate in the red-lit “brain” modules. Our control paradigm enables robots to exhibit properties that go beyond those of any existing machine or of any biological organism. That’s how the paper describes it. We get it, robots are superior! 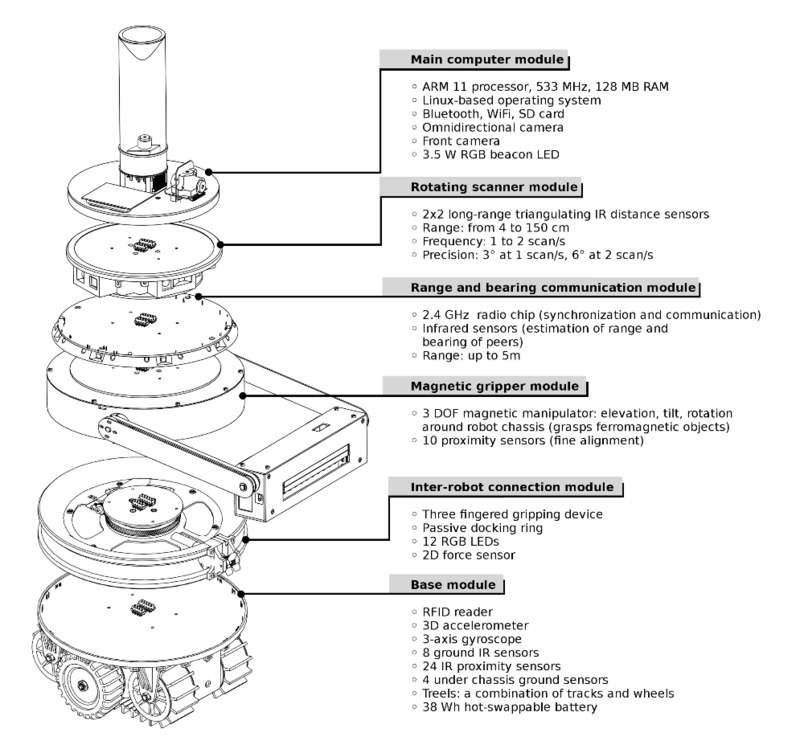 Each MNS robot is like a little custom layer cake: wheels and “treels” (track-like wheels) on the bottom; then a ring with a little gripper that can rotate around and expand to hold onto another robot’s ring; then an optional utility module like a magnet for picking up nearby objects; then the computer and sensor package, which has the Wi-Fi, 360-degree camera, range sensor and identification beacon. You can see the rest of the parts in the diagram at right. Obviously these little basketball-sized things aren’t going to do any serious work. They don’t even have arms, or guns, or vicious blades. But the robots in the experiment are just to demonstrate the logic and benefits of such a setup. Imagine a real-world application with a dozen or two of these things rolling around a construction site. They could operate on their own to pick up supplies and trash, recharge and do simple deliveries, but join together when they need to do something unusual like pick up something heavy, climb a wall or monitor the site at night. Our vision is that, in the future, robots will no longer be designed and built for a particular task. Instead, we will design composable robotic units that give robots the flexibility to autonomously adapt their capabilities, shape and size to changing task requirements. Clearly, it’s the future we deserve.